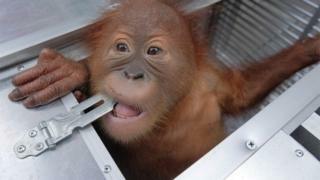 A Russian man has been arrested in Bali on suspicion of trying to smuggle a young orangutan out of Indonesia. "The Russian also had injections and drugs in his bag. He said he planned to re-administer the drugs when they transited" in South Korea, Dewa Delanata, from the airport's quarantine office, told the Jakarta Post. Two live geckos and five lizards were also found in the passenger's luggage. Is beauty killing the beasts? Orangutans face threats from poachers and farmers in Indonesia. The Tapanuli orangutan, found in isolated forests in Sumatra, has been described by conservationists as the most endangered great ape species in the world.